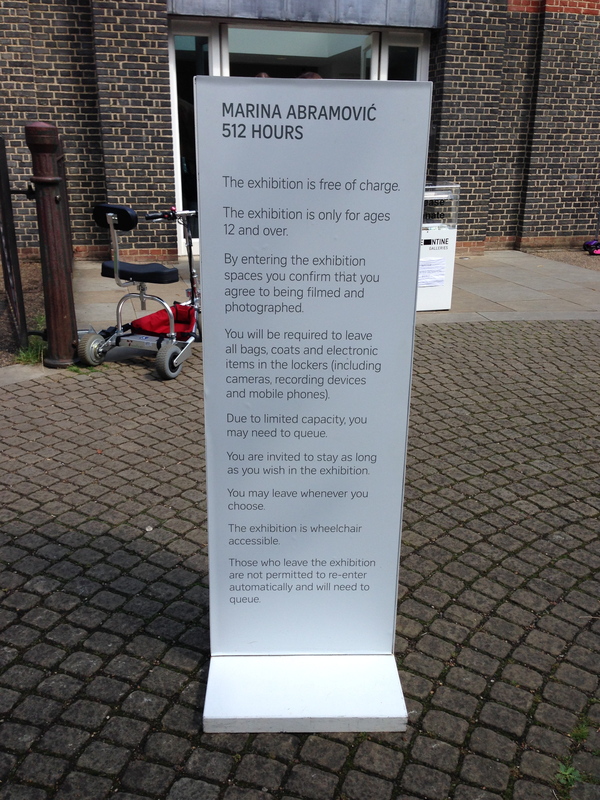 I was leaning against a wall in the Serpentine Gallery just watching people when Marina Abramović walked over and stood in front of me. Elsewhere in adjoining rooms there were some people sitting in chairs focussing on brightly coloured squares of paper on the walls in front of them. In one large space some were standing on a dais, their eyes closed. Many held hands. In another room, there were about eight others seated on simple wooden chairs at simple wooden desks engrossed in a task of counting lentils or grains of rice. Behind them, there were some camp beds on which others were lying, covered by bright blankets. I watched Marina tuck people in. She used slow and tender gestures, but the association for me was one of exam halls and hospitals and that was too close to my recent past. I gravitated to another room where a number of people were walking slowly, slowly up and down, up and down the gallery. Everyone wore sound-baffling headphones; no one had a watch and phones and electronic devices had been secured in lockers beforehand. Time was not so much suspended as interiorised. Time and speed: the two are part of a whole. “Hello,” Marina whispered to me and two strangers on either side of me. She signalled that we should take off our headphones. She smiled. “I want you to walk the length of the gallery seven times. Slowly. I will show you the tempo. The purpose is to slow your body, to oxygenate it. You will find that your mind is like a Ferrari, but, kids, you’ll really enjoy it.” It was nice being referred to as “kids” in her Serbian accent. And with that she took my hand and I took the hand of the stranger on my other side and we walked, slowly, slowly, slowly. The thing about walking so slowly, so mindfully, is that it’s difficult. Sometimes you unbalance and wobble and your companions squeeze your hands and steady you. This was a comforting, comradely feeling. Marina left us after half a length and we became a trio doing our exercise. At one point we overtook another walker – I felt like the Usain Bolt of live art – but that was ok. It wasn’t a competition and it wasn’t as if we were all cruising for the artist’s attention. After our seven walks, we separated and melted away from one another. 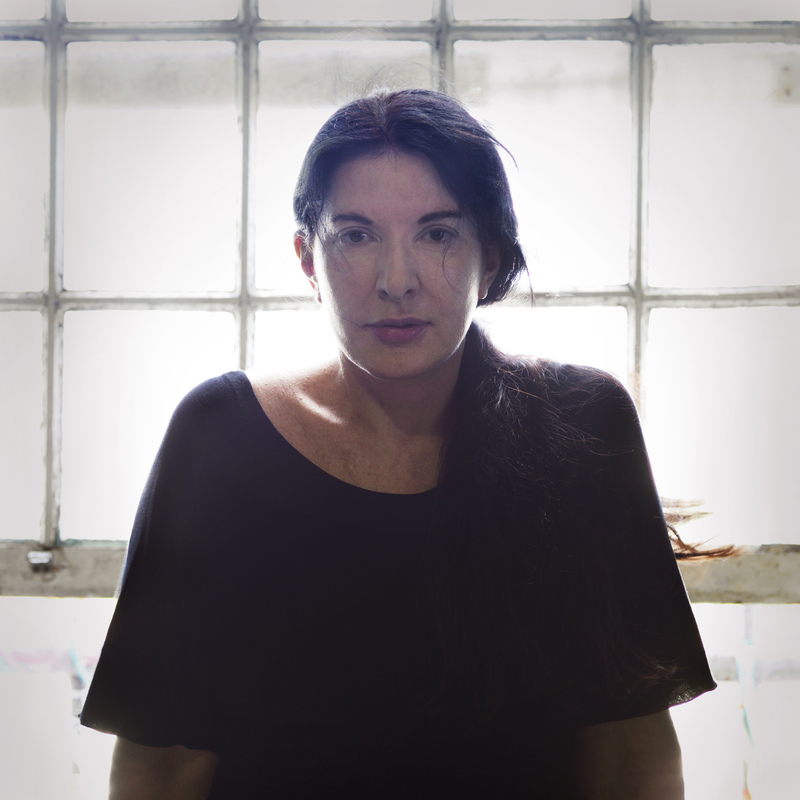 In making art with no object, it is, perhaps, as if Abramović wants us, each participant, to acknowledge and welcome our own agency in the world. To stop and listen. One might say that her focus is what allows the participant to be present, which would make 512 Hours a companion piece to the Moma show. And, given the velocity of the world just yards away from the interior of the gallery, that is a remarkable gift.